Towards the end of ‘An Interview with Dario Argento’, Maitland McDonagh suggests to the director that only he “could take the stories of Edgar Allan Poe and make a movie that’s about murdering women in grisly ways”. Reading this interview again at the end of the new expanded edition of McDonagh’s Broken Mirrors/Broken Minds: the dark dreams of Dario Argento, I am struck for the first time by something in the director’s response to this rather perfunctory suggestion. I imagine him sitting there, small and strange, while he considers the work of one of his greatest influences: “Edgar Allan Poe had a terrible imagination. He drank, he took drugs, and he saw many horrible things in his mind. Nice people don’t see such things … I think we have an image of him almost as an angel, as someone who suffered in pursuit of his visions.” (p. 247) There is something about McDonagh’s book that works to superimpose the figure of Argento over this romantic and melancholic image of Poe, so that by the time you come to read this response, the Italian horror maestro seems to be talking really, about himself. Its tracing of the director’s career sweeps from the highs of his supernatural horror masterpiece Suspiria (Italy 1977) and the urgent brilliance of his murder-mysteries Deep Red (Italy 1975) and Tenebrae (Italy 1982) to the deep, foggy place from which the director continues to practice today, disappointing fans and critics worldwide with films like Mother of Tears (Italy/USA 2007) and Giallo (USA/UK/Spain/Italy 2009). Nevertheless, McDonagh’s book, first published in 1991, continues to provide the most panoramic (English-language) view into the world of Dario Argento’s films to date—a world full of all those things that nice people don’t see. Broken Mirrors/Broken Minds is made up primarily of a film-by-film analysis of Argento’s oeuvre. This is arranged chronologically, beginning with The Bird with the Crystal Plumage (Italy/West Germany 1970) and finishing with Argento’s attempt to break into the U.S. market in 1993 with Trauma (Italy/USA 1993). McDonagh’s style fuses a number of different approaches to the material, producing highly informed and often original discussion that pulls out and investigates some key tropes in this under-studied director’s style. Astute mise-en-scene criticism is contextualised through frameworks of narrative analysis and film reception, bookended, in most cases, with rigorously researched production details.As with previous editions, the most insightful chapters of the book consider the films the author holds in highest regard, and so the sections on Deep Red, Suspiria and Tenebrae are particularly rich and illuminating. In ‘Le cinque giornate / Deep Red’, McDonagh considers the complex web of allusions Argento sets up in his influential giallo, specifically through discussion of the ways the films’ formal structure is infected by the notion of the doppelganger, and its relationship to Michelangelo Antonioni’s 1966 film Blowup (UK/Italy/USA), which Argento has cited as one of its key inspirations. McDonagh’s skill in close formal analysis is compelling, as she shows how Argento’s fascination with the process of representation lays at the heart of every move his camera makes. This detailed account of Argento’s formal style is extended into the chapter on his later giallo Tenebrae, where McDonagh describes how the director’s distinctive cinematic language produces, in this case, “an unnervingly self-contained work” (p. 180) that simultaneously showcases the director’s inimitable skill for disorientating the viewer with an obsessive rendering of space. 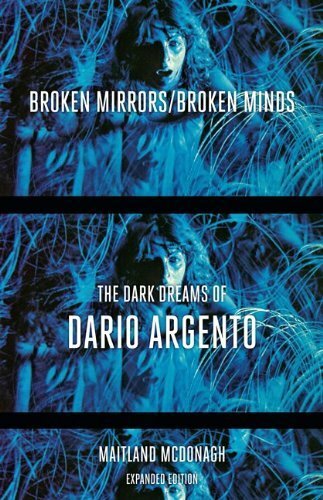 Chapter four considers the two instalments of Argento’s ‘Three Mothers’ trilogy completed at the time of Broken Mirror’s first published edition. The material here on Suspiria and Inferno (Italy 1980) is particularly fascinating in the wake of the 2007 release of the trilogy’s final chapter, Mother of Tears—a film that has, after a twenty-seven year long wait, polarized fans and critics. McDonagh’s focus on the use of colour in Suspiria, where the director used 1950s technicolour processing to achieve its saturated, nightmare/fairytale palette, makes for wonderful reading and her description of Argento’s baroque stylisation recalls the wonder of experiencing this intensity on screen. There is also considerable attention afforded to the Thomas De Quincey essay that provided Argento with the idea for his wicked triumvirate, ‘Levana and Her Ladies of Sorrow’ from Confessions of an English Opium Eater. With these detailed case studies of Argento’s films, the book also serves as a useful pedagogical tool, providing useful readings to accompany screenings of Argento’s work in film courses and an excellent model for close analysis of texts that have otherwise gone unnoticed in the history of film criticism. The expanded edition of the book offers a new introduction that brings readers up to speed with the eight films Argento has made since the 1991 publication, and it is here that McDonagh attends to Argento’s excellent 1996 film The Stendhal Syndrome (Italy). Described by the author as ‘a funhouse reflection of Hitchock’s Vertigo (1958), the five paragraphs afforded The Stendhal Syndrome here stress the need for a new consideration of the relationship between Hitchcock and Argento—a comparison that has been often made, though little considered. The new introduction also includes material on The Third Mother, though it seems a shame to refuse the film’s position as the conclusion to Argento’s trilogy by considering it briefly here, rather than alongside the other two films. This, perhaps, is one of the limitations of the book’s chronological structure, but what it does offer on these more recent films is steeped in a peculiar tone. It is this tone and the brevity of the material on Argento’s later work that brings me back to the melancholy place this review began.In the material on Deep Red, Suspiria and Tenebrae, McDonagh’s writing can tend to mimic some of the qualities of Argento’s formal style, with its flourishes (a taste for alliteration, for example) and assault of description. But as with so much of the sophisticated fan writing that goes on around Dario Argento’s work, McDonagh’s academic study, in the end, is redolent of disappointment in the director. There’s a tension here, between maintaining the icon of the auteur in the image of the moment of his greatest work and finding a way to absorb, into that very image, increasingly difficult, or what McDonagh calls ‘unconvincing’, films. What this problem, and recent critical interest in the notion of ‘bad cinema’ suggests, I think, could actually be a way forward; this moment of disappointment could be the very place to begin to think through Argento’s work and to find ways of allowing it to mean beyond our initial expectations. This prompts me already to wonder what we might make of a film like The Third Mother in ten, or in twenty years time, after all—and as McDonagh herself notes—Argento’s masterpiece Deep Red was considered in 1976 by Vincent Canby to be the work of a ‘director of incomparable incompetence.’ As Argento, now seventy-one years old, continues to make cinema that propels those nightmare visions of ‘things nice people don’t see’ into our world, we might stop to consider the possibility that we’ve all become a little too nice. When we’re ready, there’s more work to be done—and McDonagh’s book is a solid and indispensable resource to help light the way.